Hiring a contractor for your kitchen remodel project is probably the most important decision you’re going to make. Is right up there with choosing the design. Your contractor is the person who is going to run the show from start to finish. That includes hiring the crew, purchasing the materials and inspecting the work. Here are some of the things to keep in mind when picking a contractor for your kitchen remodel. You could probably list at least five friends or family members that have already had a kitchen remodel. Those are the first people you want to go to when it comes to finding a contractor. They’ll be able to give you an unblemished review of that contractor’s work. Be sure to ask how that contractor handled problems. That could be key to the overall success of your project. The only contractor you should be working with is someone who has been licensed in the state. They should also be fully insured. A contractor can also have many professional associations. All of these credentials are verifiable. Don’t take a contractor’s word for it. Look it up online for yourself. You would be well advised to interview at least three or four contractors for your kitchen remodel. They may all turnout to have the same level of credentials and work experience but personality is an important factor. You want a contractor that was responsive to your concerns and able to adapt to any change. You should never feel like a burden to a contractor. A contractor will always provide you with references. It’s up to you to follow up with those past clients. It stands to reason that a contractor is only going to provide you with customers who are completely satisfied. But you can still find useful information from those clients and might even be able to pick up some helpful shortcuts. Any contractor you interview for your project should be able to provide you with a written estimate. They may come and take measurements, listen to your design ideas and then be able to provide a ballpark price but unless that is written out you’ll never know what it truly will become. Bottom line: never hire a contractor who doesn’t provide a written estimate. There’s nothing wrong with asking a contractor for discounts. This is something they expect on every job. 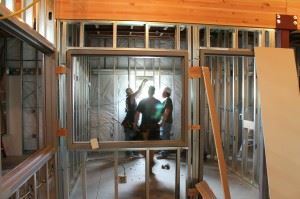 There are also ways that you can save money on a remodel job by doing some of the work on your own. For instance, you may want to handle the bulk of the demolition. Taking down cabinets and pulling up linoleum isn’t that complicated. This is where hiring a company like Junk King Atlanta can be a big help. These are professional junk haulers who have a lot of experience getting rid of all kinds of demolition waste. Whatever mess you make, Junk King Atlanta will be able to clean up in no time at all for very affordable price. After you hire your kitchen remodel contractor, be sure to hire Junk King Atlanta for the cleanup. This entry was posted in Atlanta Junk Removal and tagged cleanup, Junk King Atlanta, kitchen remodel on June 26, 2017 by Junk King. Last updated June 26, 2017 .